For outdoor events, one needs a specialist that can draw a crowd and entertain them without either a stage or technicians. An artist who can perform without needing special lighting nor large sound systems. This requires experience and self-confidence in addition to talent. Tom has travelled the world and has the flexibility to communicate to crowds in nearly any setting. Just provide Clown Tom Bolton with enough space and a passing crowd and he does the rest. He brings all of his own equipment including a mobile battery-powered sound system. No need for electical outlets or cables. Tom can present shows on a stage or without. 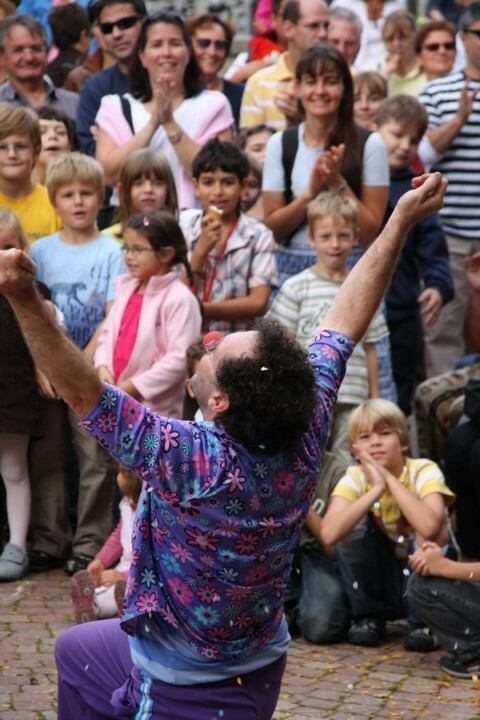 An important factor to working without a stage is to integrate the audience into the show. Spectators should be used in a respectful way so that they have fun and are not just made fun of. Tom’s improvisation and gentle way of making everyone part of his show is what makes him interesting for fans to see him again and again. It’s world class festival entertainment! Festivals can have thousands of visitors. This means the space available can be critical so Tom can do a big show without blocking the way through. Tom can also change the show location if needed but ideal places are not too close to the entrance to a tent or keeping people from getting to a concession stand. Outdoor events can also be loud. The normal background noises don’t annoy Tom’s show but he is best not placed right next to a live band or place blasting music. Especially for events with limited space for shows, Tom also offers his walk-about entertainment. He strolls around and improvises with every situation. This interaction is focused on individuals and small groups rather than large crowds. A little bit of danger to the performer always adds tension to the show but safety of the audience is of first priority. It sounds like a cliche‘ but Tom really does appeal to all ages and brings out the inner child of every adult. 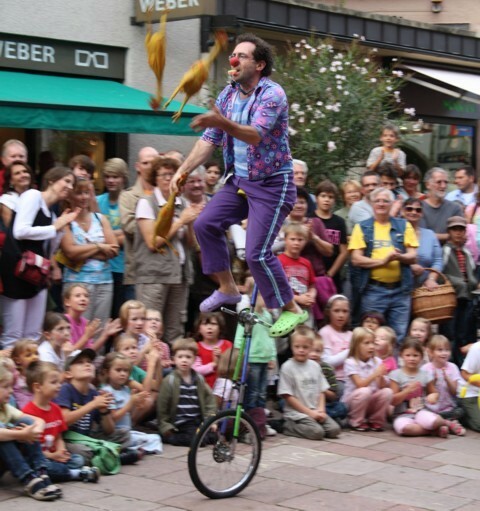 Juggllng rubber chickens on a tall unicycle – no problem! By the end of the show the audience is really amazed and happy. 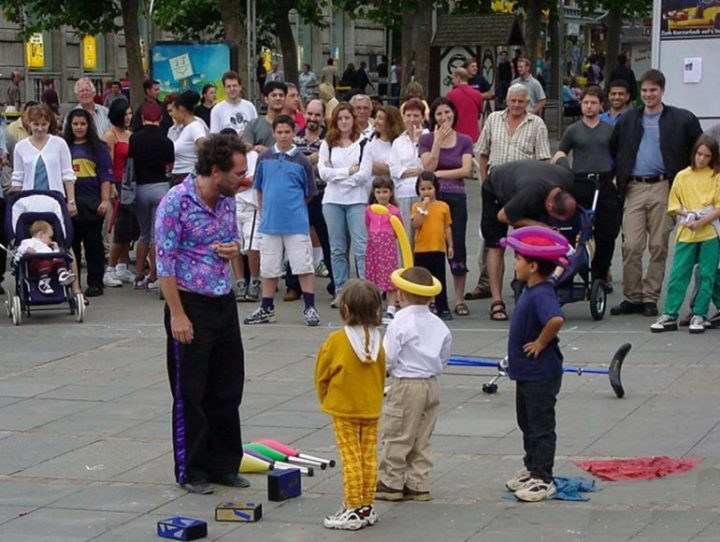 Tom’s experience entertaining people around the world means he can appeal to all cultures, nationalities and ages. He is truly a universal performer for all types of situations. Contact him to find out how he can be the highlight of your next event. As an alternative to shows, Tom also offers walk-around entertainment. This can be done in his normal clown costumes or his new funny Bavarian outfit. 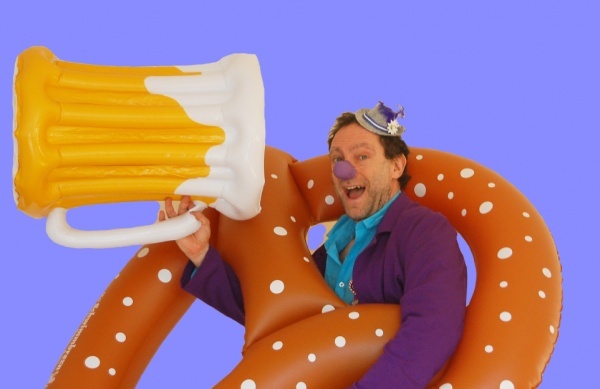 His purple lederhosen and oversized beer mug and pretzel are a comical take on the local traditions in his adopted home of Germany. Tom’s festival entertainment is availible world-wide for all kinds of events. 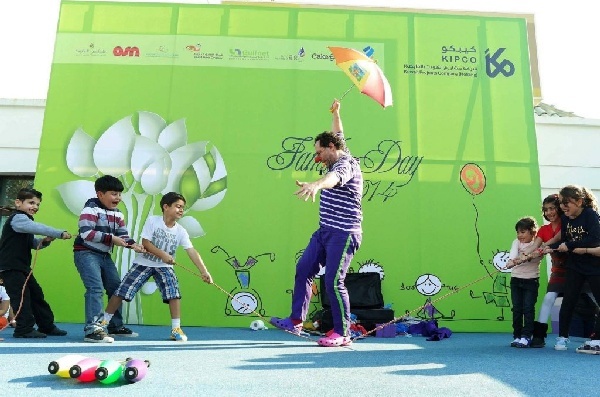 He amuses for audiences of all ages and cultures like in this photo from a performance in Kuwait.